Tax credit scholarships provide an Illinois state income tax credit to individuals and corporations that contribute money to an SGO. The SGO awards scholarships to eligible students from low-income families. Individuals and corporations that donate to SGOs may receive a credit for their Illinois state taxes equal to 75 percent of donations to an SGO. Example: A taxpayer donates $10,000 to an SGO. The taxpayer will be eligible to claim a $7,500 tax credit when he or she files their 2018 state taxes. Beginning January 2, 2018, donors can indicate the amount they want to donate and reserve the corresponding tax credits through the Illinois Department of Revenue’s website. The Department of Revenue will grant tax credits on a first-come, first-serve basis. Individuals and corporations then have 60 days to donate that indicated amount to an SGO. Individuals may direct donations to a particular school or subset of schools; corporate donors cannot restrict their donations. 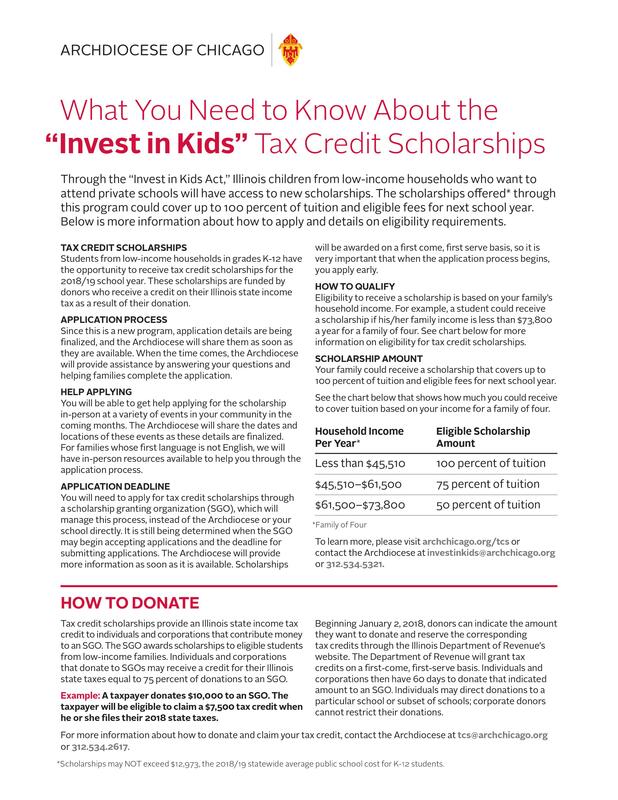 For more information about how to donate and claim your tax credit, contact the Archdiocese at tcs@archchicago.org or 312.534.2617.